"I WANT YOU TO FILL IT UP TO HERE". Jim and Mo have just been to SW France for the seventh time. And, as usual, they brought some friends with them. But the holiday was soon over, because Jim set them all to work. But occasionally he gave them time off to eat, and to eat and to eat. And, from time to time, they had a bit to drink also. 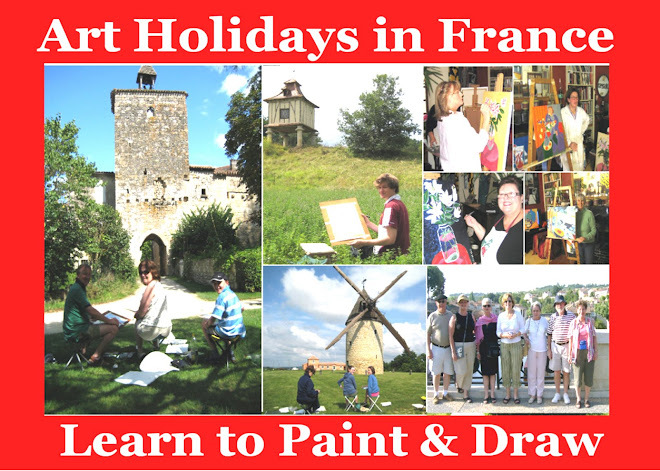 Look what we painted in France. At the Bar du Commerce in Mezin. Underneath the arches at Poudenas. Painting at the water lily farm. Lunch in the garden at The Mill. "You all get started now. And don’t stop painting until I tell you."